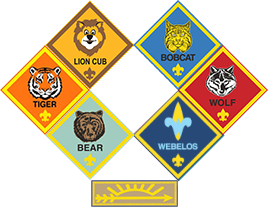 To earn the Webelos Badge, a Cub Scout must complete the following requirements. Complete two Webelos elective adventures of your den or family's choosing. With your parent or guardian, complete the exercises in the pamphletHow to Protect Your Children From Child Abuse: A Parent’s Guide, and earn the Cyber Chip award for your age. Note: If your family does not have Internet access at home AND you do not have ready Internet access at school or another public place or via a mobile device, the Cyber Chip portion of this requirement may be waived by your parent or guardian. If the Cub Scout has not previously earned the Bobcat Badge, it must be earned before the scout hits the Trail toward his Webelos Badge. After the Cub Scout has completed an adventure, he is awarded the adventure's pin at the next Pack meeting. Complete at least Requirements 1 and 2 below. Use tinder, kindling, and fuel wood to demonstrate how to build a fire in an appropriate outdoor location. If circumstances permit and there is no local restriction on fires, show how to safely light the fire, under the supervision of an adult. After allowing the fire to burn safely, safely extinguish the flames with minimal impact to the fire site. Complete Requirement 1 and at least two others of your choice. Discuss with your family, family’s faith leader, or other trusted adult how planning and participating in a service of worship or reflection helps you live your duty to God. Complete Requirement 1 and at least five others. Try a new sport you have never tried before. With your den, prepare a fitness course or series of games that includes jumping, avoiding obstacles, weight lifting, and running. Time yourself going through the course, and improve your time over a two-week period.